This week the HaveFunBiking Bike Getaway Contest spotlights Stillwater, the 1848 Birthplace of Minnesota, located on the scenic St. Croix River. A bike friendly destination where, when not pedaling, see paddleboats, riverboats and gondolas glide over the water while enjoying unique shopping, dining and entertainment experiences surrounding the new Brown’s Creek Trailhead. 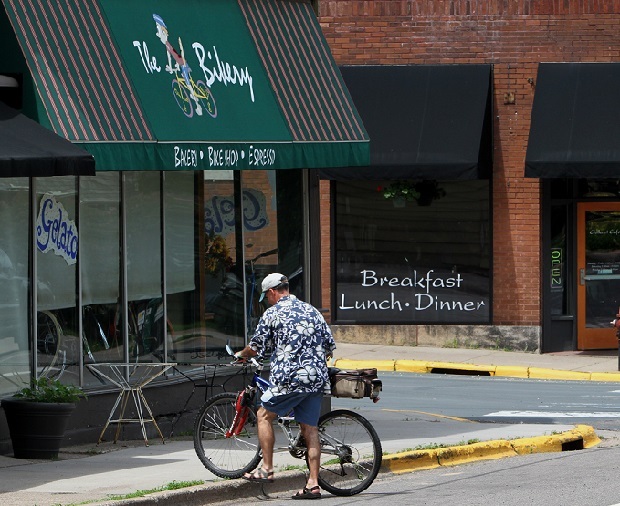 A great starting point for many bicycling opportunities, Stillwater is located on the eastside of the Twin City Metro Area and 30 minutes from Downtown St. Paul. Biking in Stillwater, on the hill at the corner of Fourth Street S. and Churchill Street W. next to Chilkoot Cafe & Cyclery. Along with the new Brown’s Creek trail that connect to the Gateway Trail, touring cyclists will find hundreds of miles of low traffic, scenic roads meandering in and out of the river valley here in Washington County and over the Lift Bridge into Wisconsin’s countryside. When not riding other fun activities include: birding, hiking, paddling or just hanging out in Stillwater, along the river. This Bike Getaway highlights a prize package you can build on. It begins with a complimentary one-night stay for two, at Water Street Inn, located in the historic downtown Stillwater area on the river near the remarkable Lift Bridge and bike trail. Then quench your thirst at the newest craft beer brewery in town, also near the bike trail, on Main Street. Here enjoy a Rock Star Flight (every beer on tap) and two Maple Island Brewing pint glasses to take home. Map of the Browns Creek and Gateway Way Trails. And, stop into Chilkoot Cafe & Cyclery, on the hill at the corner of Fourth Street S. and Churchill Street W.
The winner of this Stillwater Getaway Package will be selected from our HaveFunBiking e-Database on Tuesday, August 18th. If you haven’t subscribed, please register now for our weekly drawings and the HaveFunBiking e-Newsletter by clicking here. 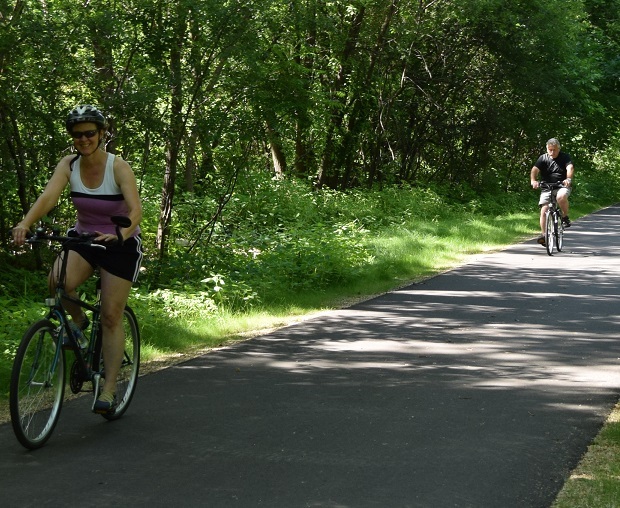 The City of Stillwater is a popular spot for active individual’s using the new Brown’s Creek paved trail system when visiting. A charming historic town built from its early lumber and river e-commerce days, this bike friendly community is a half hour drive from the St. Paul, located on the St Croix River, bordering Wisconsin. 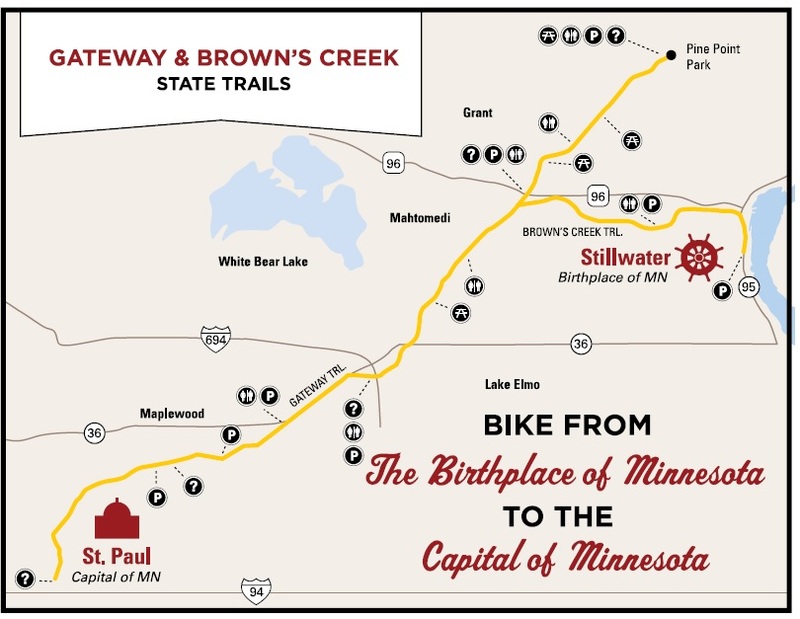 The bike trail here gradually follows the Brown’s Creek Valley out of town and intersect with the Gateway Trail that you can ride all the way into St Paul. Staying in Stillwater, enjoy the historic downtown area where it’s easy to find a delicious place to eat or stop after a ride to enjoy an ice cream treat. If water sports (fishing or paddling) are also your thing, extend your stay for more fun on the water. With more than 15 lodging properties (B & B’s, Historic Inn’s, Hotels and House/Lodge rentals it’s easy to make Stillwater your vacation headquarters and waking up to the relaxing sounds of an occasional riverboat whistle. For more information about Stillwater and its many options, see: DiscoverStillwater.com. If you like the bike map’s in the HaveFunBiking.com “Bike/Hike Guide” Minnesota edition, here is your chance to win a Getaway Package to one of the bike friendly areas we showcase. Each week, starting June 2nd, we will draw an email address from our e-subscriber database. The selected winner will then be informed they have won a Bike Getaway Package to one of our bicycle friendly destinations highlighted the previous week. The last drawing will be held on September 28th, for a Fahrlander Fitwell Bike. Just registering here to win, it’s simple and no cost to you. Congratulations to Hannah Berg, of North Carolina who won our HaveFunBiking Getaway Contest Package to Peterson, Minnesota on the Root River Trail. * Please note all our e-database subscribers’ email addresses are used strictly for the HaveFunBiking.com’s e-Magazine and contests and will not be sold to any third party venders. This entry was posted in Destinations, News and tagged bike getaway contest on July 28, 2015 by Russ Lowthian.